The price of a travel insurance policy is based on a number of factors but if you have pre existing medical conditions this could increase the risk and as a consequence we need to know about it. However our approach we feel is better than most because were only interested in you declaring serious medical conditions which could cause you to cancel a holiday pre departure or require you to make a hospital visit abroad. We define serious conditions as conditions that have occurred in the 12 months and include such things as lung conditions (not mild asthma controlled by no more than two medications including inhalers), heart conditions(including angina) or cancer. If you have been seen by a specialist clinic or hospital in the last 12 months for tests, treatments or investigations then will need to chat to you as well. However if you have stable and well controlled conditions such as high blood pressure, cholesterol, diabetes, etc. 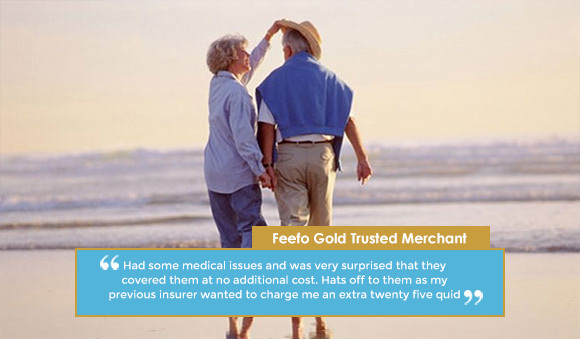 then we will normally cover you as standard provided you have not had your medicine changed in the last three months and you dont require more than 2 routine medical check ups/ reviews a year. Remember it is vital that we know about these conditions as they may affect a claim so if you have any questions then please call us on 0843 4590876 where our team are available 7 days a week to provide help.